Annual Tech Cities Research Program Ranks the Top 22 Global Destinations for Tech Companies. Savills Studley, the leading commercial real estate firm specializing in tenant representation, is pleased to announce the results of Savills’s annual Tech Cities 2017 research program. Based on a strong talent pool, favorable real estate costs and the city’s overall business and tech environment, Austin has topped the global rankings for the second consecutive year. 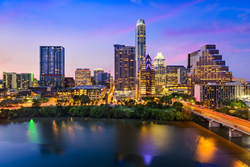 “It’s great to see continued recognition for the ongoing efforts private and public stakeholders have made to elevate our city’s status as a hub for innovation and entrepreneurship,” said Alan Peters, Senior Managing Director at Savills Studley’s Austin Office. “Austin’s success is the result of a business community that works in collaboration to approach our biggest challenges head on and rise tides for all ships,” added Corporate Managing Director John Scoblick. Savills Studley is a subsidiary of Savills plc, the premier global real estate service provider with over 30,000 professionals and over 700 locations around the world. Over 100 metrics were analyzed by Savills for each city in the global study. Austin ranks ahead of the Tech Cities Average for City GDP Per Capita, Broadband Download Speed, Start Ups Per 1000 People, Population Growth, Millennial To Boomer Ratio and several other factors. Two other U.S. cities – San Francisco and New York – were ranked 2nd and 3rd respectively, followed by London in the 4th position. “With one of the strongest economies, Austin has become known around the world as a center of boom for innovation, technology and startups,” said Jonathan Packer, Austin Chamber of Commerce Director of Global Technology and Innovation. “That’s due to a combination of factors. We have an ecosystem that supports a progressive entrepreneurial spirit, a business environment favorable from a tax perspective, a comparatively lower cost of living, and an attractive quality of life, all in addition to a deep reservoir of talent companies look for when hiring." To see the complete rankings and analysis of all 22 Tech Cities, visit: http://www.savills.co.uk/tech-cities.